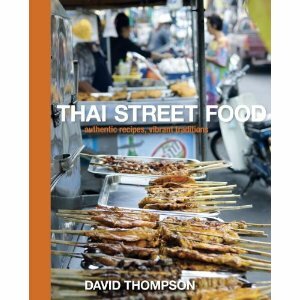 After two months, I suspect that my failure to consistently cook from and blog about Thai Street Food is my review of Thai Street Food. It is just too much of a strain. Melted on the stove during Thai cooking. Still works. I made a valiant effort in December, but never posted about any of it. I'm not sure why. Almost everything I made was excellent. I especially loved the charred noodles on page 140: You take wide, fleshy fresh rice noodles and put them in a skillet with just a drop of oil and let them blacken and blister and develop a crust. I made these twice, the first time with the accompanying chicken, the second time to serve in place of rice. Delicious. The other standout dish was the stir fried minced beef, which I also made twice, and which we all loved. I would make it regularly, but you absolutely need Thai basil and I can't get that without driving to the Asian market in San Francisco, where tracking stuff down is like a scavenger hunt. Which is the problem with this whole book. I hope a day will come soon when I can (re?) dedicate myself to this exotic and beautiful volume, but December was busy and January is going to be completely nuts. 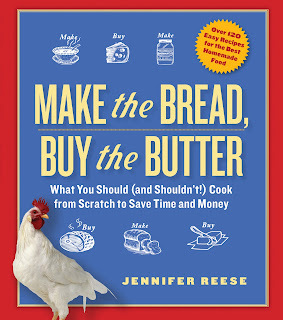 I need a book that is easy and accessible that I will actually cook from and blog about. I did not want to make, for example, her guacamole with tomatoes and bell peppers any more than I would want to make a pissaladiere out of a Rick Bayless cook book. I did not want to make sweet and spicy cocktail nuts, or tzatziki, or gravlax or dieter's tartine or cola-and-jam spareribs or pork roast with mangoes and lychees. I hope it is self-evident why I didn't. In fact, it is not self-evident. Not to me, anyway. I do agree that this book includes an odd mash-up of recipes and I take her point about turning to Greenspan for a guacamole recipe. But what is wrong with sweet and spicy cocktail nuts? They sound like something I could get very fat on. Pork roast with mangoes and lychees? Weird, but perhaps delicious. In any case, interesting. I'm going for it. And the other night I made those cola-and-jam spareribs, which sounded delicious to me. They were certainly easy. You just paint them with some orange juice and jam, baste with a can of Coke and let them roast for a few hours. It was so very relaxing to pop ribs in the oven and know that dinner was making itself as I worked at my desk throughout the late afternoon. We ate all the ribs that night and there were none left over for lunch the next day. I would not make them again because I suspect there is a better rib recipe out there, probably in a Texas Junior League cookbook. But Dorie's was perfectly respectable. On another subject, I have fallen into a deep, dark pit called The Passage by Justin Cronin. We started listening to this 37-hour vampire saga on CD during our vacation, but while my family has lost interest, I've become a mad fan. I listen to it while I'm driving, cooking, folding laundry, washing dishes, eating lunch. It has character, metaphor, power writing, moral philosophy, metaphysics, dreams, creation myths, blood sucking freaks, epic battles, propulsive narrative drive. It's like Lost, The Road, The Lord of the Rings, and Shirley Jackson's Lottery all rolled into one. RECOMMEND! i'm with you, i would buy the book for the dieter's tartine and cola-and-jam spareribs recipes alone. but i guess that's what makes the world go round, not to mention me grow round. I really enjoy reading your blog, and I especially appreciate seeing you work your way through cookbooks so meticulously. I have all of Dorrie's books and everything I have made has been good, at worst, and great on many occasions. There's certainly something to be said for a recipe you can trust to actually turn out well, without having to plow through 10 books to find some variation that's not crazy complicated or throws in some weird ingredient just to be novel. Simple and straightforward usually wins the day, for me. Thank you for the book recommendation. It sounds focus-grouped specifically for me. If it were just the one ingredient, I would say just grow some Thai basil. I have made a number of Dorie recipes in the past few months and find them totally accessible and delicious. So I for one am PSYCHED that you're taking on her new book. I don't know which asian market you are going to in SF but I found that once I started going to Manilla Market in the Excelsior I started making more asian food. It is off the 280 and seems much more organized (and the items stay in the same place week after week). If you are in the east bay or on the peninsula, 99 Ranch stocks Thai basil as well. I love your blog and this is the first time I am posting...since I had to recommend "Cronos" -- a vampire flick directed by Guillermo del Toro about 20 years ago. Lots of the same adjectives to describe it! Thanks y'all and Happy New Year!